New Mazda 6 unveiled | What Car? The all-new Mazda 6 has been unveiled ahead of its official debut at the 2012 Moscow motor show. It goes on sale in the UK in early 2013 and uses Mazda's Skyactiv technology to keep fuel consumption and CO2 emissions low. As expected, the new Mazda 6's styling sticks very close to that of Mazda's Takeri concept car, which made its debut at the 2011 Tokyo motor show. Mazda says it's the latest embodiment of its 'Kodo' design language. The new 6 has a very similar overall shape to the Takeri, but has more conventional door mirrors and handles, light lenses and bumpers. Unlike the current car, which is available in hatchback, saloon and estate forms, the new 6 will be available only as a saloon or estate. Both are due on sale at the same time. Mazda has confirmed the new 6 uses the latest version of its Skyactiv technology, which combines lightweight construction with an efficient new range of engines and gearboxes. The 6 is expected to use the same engines as the CX-5 SUV, so there'll be a choice of a 162bhp 2.0-litre petrol or 2.2-litre diesel units with 148- or 173bhp. The petrols have unusually high compression ratios, whereas the diesels have especially low compression ratios. Mazda's new i-Eloop brake-energy-regeneration system makes its debut on the new 6. It recovers and stores the energy created when braking, which can then be used to power the car's electrical systems, thereby reducing strain on the engine and reducing fuel consumption. 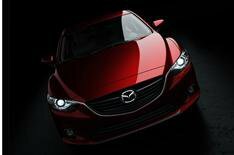 More details of the new Mazda 6 are due to be released at the 2012 Moscow motor show on August 29. Further information is expected when it makes its European debut at the 2012 Paris motor show at the end of September.